NEWS YOU CAN USE: Good Passages in The Zohar: Pritzker Edition, Volumes 1-8 (Daniel Matt on Facebook; HT Raziel Abulafia). More on Daniel Matt and his edition and translation of the Zohar here with many links. UPDATE: Dead link now fixed. Sorry about that! Equally challenging is the way halakhah refuses to signify anything beyond itself, to become metaphorical. When the rabbis debate whether it is allowed to wave the lulav on Shabbat, they want to know whether it is allowed to wave the lulav on Shabbat, period. That is because, to them, every Jewish action has enormous significance, since it is a way of understanding and carrying out God’s will. Once you begin to doubt that immediate relationship between God and the law, the Talmud can easily seem arid and overly intellectual—just as it did to Christianity and the Enlightenment. One reason I am committed to reading Daf Yomi is that I want to try to rediscover that older Jewish way of thinking about the spirit as something not opposed to the law but deeply connected to it. THE NOAH MOVIE comes out today and there are endless reviews up online. I don't have time to look at more than a representative sampling, all of which were more or less positive, of which the following are worth noting. But even though the scale of this film — the size of its budget and the breadth of its themes — is larger than anything this director has attempted before, “Noah” is less an epic than a horror movie. There are some big, noisy battle scenes and some whiz-bang computer-generated images, but the dominant moods are claustrophobia and incipient panic. The most potent special effects are Mr. Crowe’s eyes and the swelling, discordant strains of Clint Mansell’s score. Once the waters have covered the earth and the ark is afloat, a clammy fear sets in, for both the audience and the members of Noah’s family: We’re stuck on a boat full of snakes, rats and insects, and Dad’s gone crazy. This is what moviegoers thought they'd be getting, but there is more going on here, a whole lot more. Aronofsky's "Noah" includes not-so-covert messages about despoiling the planet, a bemused Anthony Hopkins as oldest-man-ever Methuselah, an unlooked-for villain played by Ray Winstone, plus romantic Sturm und Drang about finding appropriate wives for Noah's three sons. And don't forget the Watchers, a bunch of giants who look and act like Stone Age Transformers but are apparently fallen angels marooned on Earth (don't ask.) This is one busy movie. And how could I omit the review in the tradition of patristic allegory by Peter K. Rosenthal in The Onion? I am especially interested in the presentation of the Watchers and giants. There's a pretty good discussion of the issues by Steven D. Greydanus in The ‘Noah’ Movie Controversies: Questions and Answers (National Catholic Register). From the reviews it sounds as though Aronofsky gives a rather confusing account of the two. Or perhaps some of the reviewers are confused, which is likely enough in itself. Or both. In any case, according to the myth in the Book of the Watchers, the Book of Giants, and off and on in the rest of the Enochic literature (and clearly alluded to in Genesis 6:1-4), the Watchers were fallen angels who came to earth, revealed various technologies to human beings, and seduced mortal women. The children who were a result of these unions were cannibalistic giants sometimes called the Nephilim. Evidently the Watchers appear in the movie as fallen angels who are exiled to earth as six-armed stone giants. It has been suggested that the six arms come from the six wings of the seraphim in Isaiah 6. There seems to be nothing specific about the giants/Nephilim. They are either implicitly identified with the Watchers (against all the earlier traditions) or ignored. This doesn't sound like a cinematic masterpiece, but I suppose I shall have to get around to seeing it and posting my own review. A MISLEADING HEADLINE: How Darren Aronofsky and 'Noah' Got The Ark Wrong. And So Did Just About Everyone Else (Benjamin Ivry, The Forward). Darren Aronofsky’s $130 million Hollywood epic “Noah” starring Russell Crowe has displeased Christian fundamentalists with its non-literal approach to the Old Testament story. Jewish moviegoers might also find it irksome that Aronofsky and his team of designers probably got the shape of the ark wrong. Irving Finkel’s “The Ark Before Noah: Decoding the Story of the Flood” was published too late for the filmmakers to revise their design. The Ark Tablet describes the god Enki declaring: “Pay heed to my advice, that you may live forever! Destroy your house, build a boat; despise possessions/ And save life! Draw out the boat that you will build with a circular design.” Instructions are given to build the ark so that it is 220 feet wide and 20 feet high, in the shape of a coracle, a round boat familiar in Iraq, where the Ark Tablet originates. Since the main goal of the ark was keeping afloat and not going anywhere, much of the usual ship-like design would have been superfluous. No, Aronofsky is (freely) retelling the biblical version of the story, not the cuneiform one, so there is no reason for him to use the cuneiform account of the ark's shape and size. Actually this article is mostly a reviewish thingy on Dr. Finkel's new book on the cuneiform version, with lots of interesting background on Finkel himself. The author should not be blamed for the headline, but he does make the same misleading assertion in the article itself. Background on the new cuneiform Flood text and on Irving Finkel is here and links. More on the Noah movie is here and links. What would make it illegal? [Golb's lawyer] Mr. Kuby was asked. Mr. Rivellese [representing the state] countered that Mr. Golb’s behavior was clearly malicious and criminal, intended to mislead recipients and damage Dr. Schiffman’s career. Judge Eugene F. Pigott Jr. pushed the point with Mr. Kuby, asking whether it would be all right for someone to pretend to be Alex Rodriguez and confess to using banned steroids, which Mr. Rodriguez has denied. “I don’t actually see a criminal problem with that,” Mr. Kuby said. If only disrupting the established narratives about Jewish identity and politics was as simple as presenting the evidence and getting a community that understands argumentativeness to be a core part of its identity to agree. Schama’s project in the five episodes of “The Story of the Jews” and two accompanying books is about history, of course. But as Schama and I discussed in two conversations, the first in January and the second earlier this week, Schama hopes to mine that history not just for under-discussed facts, but to advocate for a different framework for public discussions of Jewish identity and politics. In focusing on entries in that history that emphasize the integration of Jews in communities of other believers, and on cultural and artistic cross-pollination, Schama pushes not just for new answers to political questions, but urges us to consider whether cultural conversations might get us closer to the core of Jewish identity than political contests. At the end of the 19th century, Eliezer Ben Yehuda was busy coming up with a variety of words Hebrew was missing, not only for print in his publications but also for his day-to-day use, as he and his family had vowed only to use Hebrew at home. One of the words the family needed, probably for the dresses of his wife Hemda or one of their daughters, was a word for pink. Ben-Yehuda simply decided to adopt the French practice of calling the flower (the rose) and the color (pink) by the same name. As we said, the Hebrews had adopted the ancient Persian word for rose in the form vered. Ben-Yehuda took that root, v-r-d, and created varod. And thus Hebrew got a word for pink. What is the use of a Targum in a cultural setting where Aramaic is not a common language anymore? And why would Christians be interested in a typically Jewish text in an otherwise anti-Jewish milieu? These and related questions have served as guides for Alberdina Houtman, Eveline van Staalduine-Sulman and Hans-Martin Kirn in bringing together the articles for the present book, which consists of three parts: 1. Uses and Functions of Targum in Europe; 2. Editing Targums and their Latin Translations; 3. Targums and Christianity. A number of the articles deal with the codicological and paratextual aspects of the relevant manuscripts and editions as witnesses of their cultural historical situations. The intended readership includes specialists in Targum, Jewish and medieval studies, (church) historians, codicologists and (Christian) theologians. THE TALMUD BLOG: Outside Aphrodite’s Bathhouse: On Rachel Neis’ ‘The Sense of Sight in Rabbinic Culture’- Guest Post by Zachary Braiterman. THE RAPHAEL GOLB IDENTITY-THEFT CASE: New York court to hear Dead Sea Scrolls first amendment case. Case centres around man who argues that mocking scholars in academic debate about Scrolls is protected by first amendment (AP). Background here and here and many links. In 2011, after the original convictions, I wrote an article on the case for Religion in the News which is noted here. AINA: Assyrian Orthodox Patriarch Dies in Germany. Cross-file under "Syriac Watch." More here (scroll down to message). HAARETZ: Whereabouts and future of Gaza Apollo still unclear. The Louvre denies reports that it will be restoring and exhibiting the statue, which was found off the Gaza coast last summer. Okay, not quite no news, but not much. The article also indicates that Hamas hopes to use the statue and its restoration to gain some political acceptance in the West. HAPPY ELEVENTH BLOGIVERSARY TO PALEOJUDAICA! It's been a busy year for me and a good one, with two big books that were long-term projects finally published. Below I have listed some of my favorite PaleoJudaica posts from the last twelve months. Also, it's worth noting that this year PaleoJudaica passed the 10,000-post mark and the current count as of this post is 10,348. Past anniversary posts are here and links. Thanks for reading PaleoJudaica! Please keep coming back and keep bringing your friends. GREG DOUDNA: The Sect of the Qumran Texts and its Leading Role in the Temple in Jerusalem During Much of the First Century BCE: Toward a New Framework for Understanding (Bible and Interpretation). The revival of Israel like a dead plant coming back to life of CD 1.5-8 is usually understood in terms of some sectarian phenomenon, which may not be entirely inaccurate, but another possibility, not necessarily in contradiction, is that the dead plant returning to life could allude to the conquests and expansions of Alexander Jannaeus viewed favorably by the authors of the Qumran texts—a reversal of the conquest of Nebuchadnezzar, Israel at last come ‘back to life’ as a serious and formidable entity on the map as it once had been in a golden age long ago. More on Greg Doudna's controversial but interesting theories about Qumran and the Dead Sea Scrolls is noted here and links. ANOTHER BLOG SERIES BY LAWRENCE H. SCHIFFMAN: The Dead Sea Scrolls and the History of the Jewish Book (5 posts). The complicated process whereby the biblical books took shape and were copied and transmitted in biblical times can only be partly reconstructed based on biblical evidence, with the help of ancient Near Eastern parallels. Clearly, the biblical era constitutes the first stage in the history of the Jewish book, or more correctly, The Jewish book, par excellence. However, for the period immediately following, the Second Temple period, the level of documentation for creating, editing/redacting, and copying and disseminating Jewish books is now enormous due to the discovery, publication and analysis of the Dead Sea Scrolls. 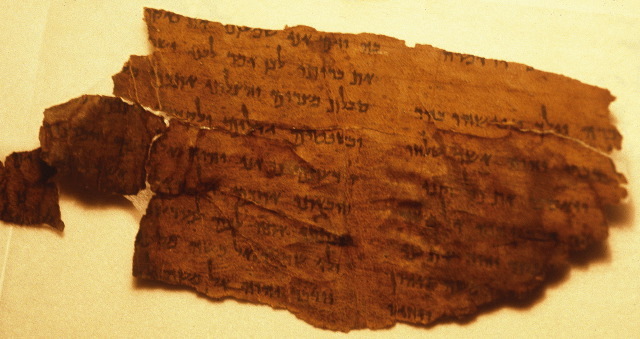 While this information relates directly to the period in which the Scrolls were copied, from the last part of the third century BCE through the early first century CE, it does allow us a model with which to supplement our understanding of the biblical period, and much of it is directly relevant to the rabbinic period in which most of the same scribal conventions were in use.